Are you a fan of the lunch meat sandwich? I do enjoy a nice meaty sandwich every now and again. However, I'm not a big fan of some aspects of deli lunch meat. I really don't care for not knowing what parts of the meat went into the chopped and pressed deli meats. The preservatives and additives are some of those questionable issues with cured meats of any kind. And then there's the price of deli-style lunch meat. Fortunately, there are a few alternatives which side step all of the above. The traditional meatloaf sandwich is one of the least expensive of the meat sandwiches -- it never disappoints. Leftover roasted turkey, chicken, pork and ham make mighty tasty sandwiches, and are a fraction of the price of deli meat. And then there's one of my favorites, for its leanness, price, lack of extra ingredients, and ease of preparing -- the baked boneless, skinless, chicken breast. 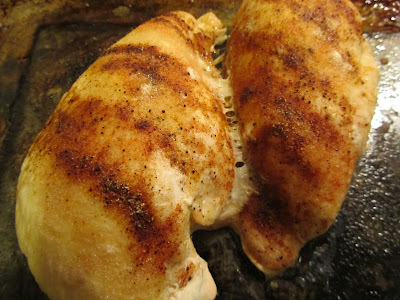 I buy the boneless, skinless chicken breasts when I find them priced around $1.50 to $1.75 per pound. This is usually in the value package; so, when I get them home, I divide them into one and two breast mini-packages for the freezer. To use, I thaw one or two, and then prepare for baking. I lightly butter the baking tray. Next, I drizzle about 2 teaspoons of vegetable oil over the tops, and turn to coat completely. Then, I season with a bit of salt, garlic powder and chili powder. I bake at 350 degrees F, for about 20-25 minutes, or until done. That's it. Easy-peasy. Once chilled and sliced, I have lunch meat for several days. For a cost comparison, recently when I have bought deli lunchmeat, I've spent in the neighborhood of $3.75 to $6.00 per pound, depending on variety and sales. For home-baked chicken "lunch meat", my cost is under $2.00 per pound, including the seasonings and electricity for the baking. The bonus is that I know what is in my meat, and I control sodium, fat and preservatives. That is a really good idea. But it isn't one we do so your reminder today will be something for me to think about. We did a lot of sandwich making when the kids went to school. They went to a private school so hot lunches were not offered so all lunches were carried from home. We were all burned out from sandwiches. I still carry a lunch every day but my preferences are soup, salad, leftovers and even sandwiches. It really is only me that carries a lunch from my home but I think I would really like a home-roasted chicken sandwich now and again. I'm sure the college kids carry sandwiches that they make since their source of food is from their own kitchens. And you're right about the price of deli meats--outrageous. I have found that if I buy a big boneless, cooked ham that the meat dept. or deli dept. will slice it for you (for free) in sandwich slices. We do that a lot and then freeze in portion sizes. Sometimes we can get the ham for 99 cents and up to $1.29 per lb. and then that is cheap lunch meat. I've never asked at the deli department in my stores, if they'd slice a purchased ham for me. I'll have to see about that sometime. I prefer a mix of soups, salads and sandwiches for my lunches. I go through phases when I want my lunches to be more than just peanut butter on bread. So I try to imagine what I would order if I were in a sandwich shop, like Panera. Panera has what they call "pick two". You choose 2 items from a small bowl of soup, a half sandwich, and a half salad. So, for my imagined Panera lunch today, I'm having a half chicken sandwich and a small salad. Hope your day is off to a great start, Alice! While lunch meat is okay, I often find it is too salty for me. However, the males in the family love it. I stopped buying it when my sons were teens because a package of lunch meat was like one bite for them. They needed to fill up on something less expensive like peanunt butter. I never really picked up the habit of buying lunch meat again. Like, Alice, I find you can get ham on sale really cheap if we want "lunch meat". Other than that, we just use left over chicken, etc. if someone wants a sandwich. And meatloaf sandwiches--I love them! You're right. They never disappoint. Oh, I know, those little packets of lunch meat would feed one man, one small sandwich. Just forget about having a man around who wants two sandwiches every day! Peanut butter is a great alternative, price wise, for sandwiches, as is egg salad. I hope that you're settling into your new home now. Have a nice day, live and learn! Great idea! I remember turkey sandwiches growing up, made from the actual giant turkeys my mom would cook. :) I do not care for sandwiches except on nice little rolls or croissants (bad me) so rarely eat them, but will eat the leftover meats with a microwaved baked potato when at home, or as is with an apple or other fruit when hiking, or made into chicken salad. So I guess it's okay. The day after Thanksgiving, eating turkey sandwiches from the big bird, is a fond memory. Chicken salad is my favorite way to use leftover, whole roasted chicken, mixing dark and light meats, with apple chunks, celery, and grapes. Hmm, now I'm hungry for that. It must be time for me to make myself breakfast! Like live and learn, I don't care for the saltiness of lunch meat--every once in awhile it's ok, but on a day to day basis, it isn't my favorite. My hubby likes it and scours the ads for good sales. Your idea would eliminate the salt and be more affordable! The saltiness, as far as flavor goes, doesn't bother me; but the high sodium content for health, does, as well as the addition of nitrates. My son would totally agree with you on the texture thing. He especially doesn't like the texture of bologna and hot dogs. Those indeterminate bits bother him. I like ham salad, too, and that's not something I find as often, when eating out. I am right there with you, on getting more than one meal out of cooking time! Have a lovely day, Busy Bee! We rarely eat sandwiches these days, because of the carbs. I love toast, so I sometimes have one piece in the morning. In terms of carbs, one flour tortilla equals one slice of bread, so a burrito meal is lower in carbs than a sandwich. Pasta, rice and potatoes are rarities these days. I'm trying hard to stave off diabetes for as long as I can, lost 15 lbs since aggressively watching my carb intake. I need to lose at least another 15 lbs to be normal weight. I'm due for a blood test in a few months, fingers crossed. You are doing so well!!! That's fantastic. And the longer you delay diabetes that requires medication, the better off your body will be. The other great thing about tortillas for wrap sandwiches is that you can fit small particles that would fall out of a traditional sandwich. The tortilla holds it all inside. I have 5 dozen eggs that I need to use soon. I think the last time we had lunch meat was when some of our friends were moving out of the country about 8 months ago. Kristi found the "all natural" sliced chicken breast at 99 cents only for 99 cents for a pound. She bought 3. We used 2 that day and still have one in the freezer. We provided the sammys mayo,mustard and bread. We met at a park at a park because they have small children. We also brought our current jars of peanut butter and jelly and those were popular. I also like bean spread and veggies for sammys. My all time favorite is BLT's yum! those only happen about once a year because of the price of bacon. Now I need to bake some bread so I can have a sammy. One of my favorites, right after Thanksgiving, is turkey breast, cream cheese and cranberry sauce. It's really delicious. My whole family looks forward to those sandwiches. I should do this with chicken breast! When I was a child, my favorite sandwich was a club sandwich, with the chicken and bacon. I hear you on the cost of bacon making BLTs so not frugal. I've tried it with turkey bacon, but the texture is just not the same. Your picnic at the park sounds so wonderful. I bet it was thoroughly enjoyed by all. So sorry your friends moved so far away. Maybe some day, you'll have the opportunity to travel to where they live. cream cheese. Hum, I have 4 more packages of frozen turkey from Thanksgiving. That would be such a fun trip for you. I'm half Scandinavian, 1/4 Swedish and 1/4 Danish. A trip to see any part of Scandinavia would be wonderful. When I cooked for the harvest crew on my uncle's wheat farm (back in the day), my uncle insisted on roasted turkey, chicken, ham, etc. for his lunch sandwiches. I used to ask my aunt why we couldn't just buy lunch meat. Out the question. My uncle preferred real meat. We do a lot of egg salad sandwiches around here. I also buy the Costco's Kirkland brand oven browned turkey breast & their Hempler's Black Forest ham. These are 3.99/lb & 2.99/lb. It's expensive, but cheaper than regular sandwich meat. I have my son slice these on the electric meat slicer, which was a birthday gift to me a couple of years ago. We then freeze the meat in smaller portions. My oldest daughter always packs herself a turkey sandwich to eat at work. I put the turkey on my salads at lunch. Egg salad is such a thrifty sandwich filling, a good stand-by. That's a great idea to buy the chunks of meat to slice for sandwiches, yourself. I don't have a meat slicer, but I should check the prices on unsliced meat at Cash & Carry. I don't know how this would compare, price wise, but you may be able to do the chicken breast thing with whole turkey breast fillets.